At some point in our your life, you probably thought OK Go, doughnuts, and space travel were the coolest things out there. You may have never imagined though that you’d be able to combine these loves into the geekiest ménage a trois ever. Chicago’s Do-Rite Donuts has created an Upside Down and Inside Out Donut today in collaboration with OK Go, who is celebrating the release of their brand new music video, also titled, “Upside Down & Inside Out,” from their album Hungry Ghosts. This video is a landmark for OK Go, who is known for their creative, groundbreaking music videos. The video, which premiered this morning on Good Morning America and on the band’s Facebook page, was the first video ever shot in zero gravity, in the skies above Russia. 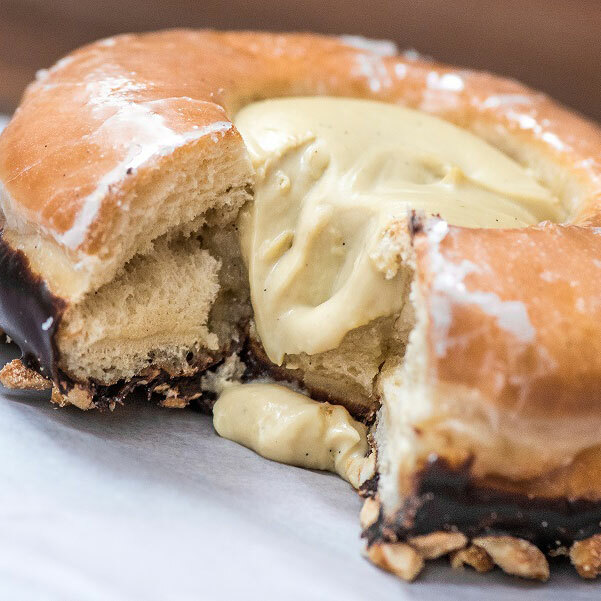 The doughnut, created in collaboration with Do-Rite, is an upside-down brioche bulls-eye, dipped in dark chocolate and topped with toasted peanuts. The doughnut is then inverted, and filled with espresso cream, then glazed in vanilla bean glaze with peanut bits making them irresistible. "I told myself I was only going to take a bite or two of the Upside Down and Inside Out doughnut. You know just to get a sense of how the chocolate, peanuts, glaze, and espresso creamy filling work together. Who was I kidding? That donut was a goner. I scarfed it down. Andy ate two in about 3 minutes. It’s a wonderfully creative and delicious doughnut,” says Tim Nordwind, bassist for OK Go. “We like to pull inspiration from various sources, including from outside the culinary world – which leads us to a lot of musicians, since we love music so much. Through our mutual friend Noelle Scaggs (of Fitz and the Tantrums), we were able to join forces with OK Go – who were also originally founded in Chicago – to help push the release of their new music video with a collaboration doughnut,” says Do-Rite Donuts Chef/Partner Jeff Mahin. “We’ve been huge fans of OK Go for the longest time – not just with their music, but they are true visionaries when it comes to their music videos, and the way they depict their music through a visual element… they’re total visual artists. We also feel the same way about doughnuts – they’re edible visual art, and we really take that to heart, so we thought this was such a perfect collaboration. We watched their latest video, ‘Upside Down & Inside Out,’ and it was so creative that it really pushed us to be better too. We actually spent time with them in LA, learned how they made the music video firsthand, and eventually brought them the doughnuts that came about, which was great!” says Mahin. The limited-edition OK Go doughnut will be available at both Do-Rite Donut locations in Chicago (50 W. Randolph Street, and 233 E. Erie St.) from today through February 25th.